WISER: Electronic resources in Theology and Philosophy (Wed 5 June 14.00-15.30) (wk 7) – This presentation is especially suitable for undergraduates preparing to work on a thesis or extended essays. It will also serve as a refresher, for all levels of study and research, covering Bibliographical databases, Primary texts and Bible studies, and will include new databases such as 20th Century Theologians. Venue: Graduate Training Room, Radcliffe Humanities. WISER: Information Sources for African Studies (Fri 7 Jun 9.15-10.45) (wk 7) – This session will cover finding tools for locating African Studies materials, key portals and gateways for African Studies and online archives of primary texts. Starting with a presentation the session will also include time for participants to try out some of the resources demonstrated. WISER: Alternatives to Google Reader (Fri 7 Jun 11.00-12.15) (wk 7) – Google is closing its popular feed reader, Google Reader on 1 July. This session will show case alternative RSS feed readers and advise on transferring your favourite feeds with minimum effort. WISER: Sources for Medievalists (Wed 12 June 14.00-16.00) (wk 8) – This interdisciplinary session will provide a general overview of e-resources relevant for British and Western European medieval studies. It will cover bibliographical databases, biographical and reference tools, web portals and collections of online primary source materials including Anglo-Saxon sources, Greek/Latin texts, chronicles, charters and literary works. WISER: Mendeley for Reference Management (Fri 14 Jun10.15-12.15) (wk 8) – Mendeley is a relatively new reference management tool and one which is receiving a great deal of extremely positive feedback. It does all the things that traditional reference management packages do (for example allowing you to build up a database of citations and insert them into word processed documents) but also has collaborative features for researchers. This session will be of interest to anyone looking for an alternative to Endnote and RefWorks as well as those who are new to reference management. I’ll be running a course on sources for US History as part of the WISER series this coming Tuesday (28th May) at 10.45am. This session is designed to provide an overview of the sources available in Oxford and online for those researching US history, and is a good general introduction for those either starting their research on US topics or for those who want to know more about the range of print, microfilm and electronic resources we offer. The session will begin with guidance on locating books, journals, articles and theses, but the bulk of the time will be devoted to primary sources, covering a wide range of topics, periods, and formats. I’ll also spend some time giving tips on how to start identifying useful sources from the vast amount of digitised material increasingly freely available on the internet. There will be time for you to ask questions and have a look at particular sources of interest yourself. The session will take place at OUCS. Please register with them at http://courses.it.ox.ac.uk/detail/TZE9 if you wish to attend. If you are unable to come but want more information and guidance on finding sources for your research in US history, I’m always happy to arrange individual meetings – feel free to get in touch! Our online guide to US History sources is also a good place to start. Open Access Oxford – What’s Happening? (various dates – see below) Researchers in receipt of grants from RCUK funding councils issued after 1April 2013 are required to make their research papers open access. Come along to one of our briefing on open access to find out about Green vs. Gold open access publishing; funder mandates and publisher policies; the Oxford Research Archive (ORA) and Symplectic; and how to find more information and help on open access. Open Access Oxford – what’s happening? A guide for social scientists (Tue 28 May 14.00-15.00) (wk 6) – Note this session is for Social Scientists only and will focus on the ESRC. No need to book in advance – please just turn up at the Manor Road Lecture Theatre. RefWorks for Humanities (Wed 29 May 9.15 – 12.15) (wk 6) – RefWorks is an online tool which allows you to manage your references, insert them into your work, automatically generate bibliographies and easily switch between citation styles. This introduction is open to all, but the section on importing references will focus on Humanities examples. WISER: Tech Tools – Reference Management (Fri 31 May 9.15-12.15) (wk 6) – Keeping track of your references and formatting them correctly for your thesis or publication is a chore. Reference management software makes it easy and is worth investigating. This introductory session gives an overview of how it works and the pros and cons of RefWorks, EndNote, Zotero and Mendeley. 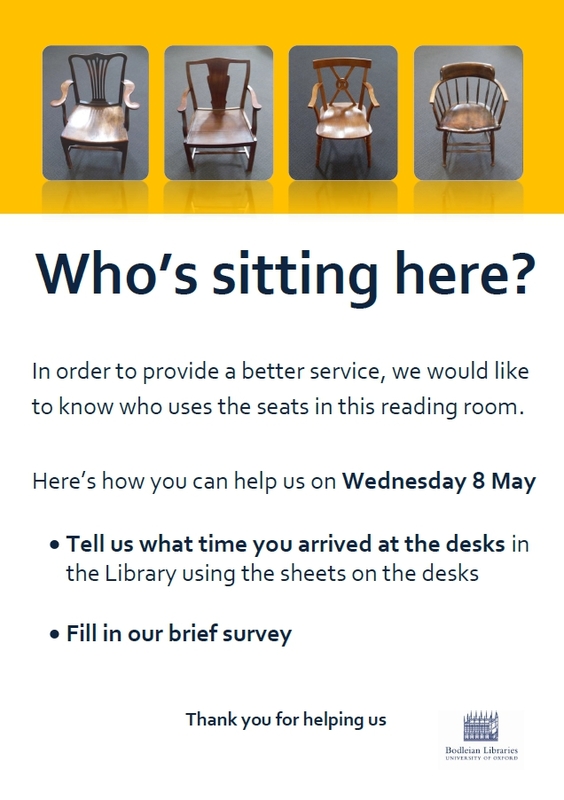 Along with several other Bodleian libraries and reading rooms, we will be conducting an occupancy survey on Wednesday 8th May. You will find a sign-in sheet and a survey form on each of the desks in the library on Wednesday. 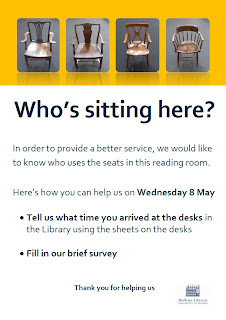 Please help us by indicating the time you arrived in the library on the sign-in sheet, and also by completing one of the survey forms. Completed survey forms may then be left in the box by the enquiry desk. Digital images: ARTstor, Bridgeman Education and VADS for teaching and learning (Tue 07 May 14:00-16:00) – The course examines two major digital image collections subscribed to by the University – ARTstor and Bridgeman Education – and a third resource, free for educational use, VADS. All of these are geared to research and teaching in the humanities, history of science and medicine, and social sciences. Viewing, presenting and managing images will be covered. WISER: Open Access Oxford – what’s happening? (Thursday 16 May 11.00-12.00 and repeated Wednesday 29 May 11.00-12.00) – As of 1st April, researchers funded by RCUK funding councils are required to make their research papers open access. Come along to a briefing on open access for research publications and Oxford’s position. We will be covering: Green vs. Gold open access publishing; funder mandates and publisher policies; the Oxford Research Archive (ORA) and Symplectic; and how to find more information and help. Keeping up with Bodleian Libraries training opportunities: Why not follow us on Twitter at http://twitter.com/oxwiser or visit the BodWiser blog at http://bodwiser.wordpress.com.